Family Trees at the Fort! 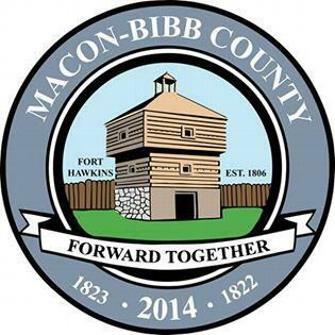 We are extremely proud of the new Macon - Bibb County Seal and we would like to thank Mayor Robert A.B. Reichert and Fort Hawkins Commission Chairman Mike Cranford for their leadership in honoring Fort Hawkins on the new seal. We also thank the new Macon-Bibb Commissioners who voted unanimously 9-0 to adopt this handsome and historical official seal. Our own dedication and hard work in preserving and promoting the rich heritage of our shared Birthplace, Fort Hawkins, helped make this new history. PLEASE SIGN OUR GUESTBOOK (near bottom of page) All comments are appreciated. Fort Hawkins is located at Maynard St. & Emery Hwy in Macon, GA.
Fort Hawkins was established in 1806 by President Thomas Jefferson and Indian Agent Col. Benjamin Hawkins as an official U.S. Army Fort and Indian Factory for trading and meeting with Native Americans. At the time, it was the western frontier and a wilderness. It overlooked the ancient Indian Mounds of the "Old Fields" held sacred by the Muskogee Creek Nation, the Ocmulgee River, the Lower Creek Pathway that became the Federal Road connecting Washington, D.C. to Mobile and New Orleans, and the future site of the city of Macon founded across the river seventeen years later.